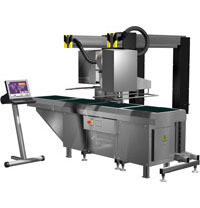 The fully automatic price labelling system is specially designed for labelling of heavy products. With this outstanding product solution weights up to 80 kg can be labelled without difficulty. With a performance of up to 40 packages per minute, this machine can be smoothly integrated into existing lines or can be equipped with up to 2 printers from the top, from the side or from the bottom.